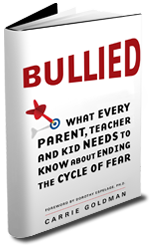 The author of Bullied: What Every Parent, Teacher and Kid Needs to Know about Ending the Cycle of Fear is Carrie Goldman, a mom-blogger who was confronted with the fact that her daughter was being taunted for having a Star Wars water bottle. You see, girls aren’t allowed to like Star Wars – it’s strictly a boys thing. When Carrie wrote a blog post detailing the situation, her daughter received an outpouring of support and it inspired Mom to look more into bullying. Bullied: What Every Parent, Teacher and Kid Needs to Know about Ending the Cycle of Fear (or WEPTaKNtKaEtCoF) is the first book that I read on the subject of bullying and I’m glad that it was. I found it to be a great introduction into the topic and well-researched without being too formal. I also liked that it examined lesser incidents of bullying along with major incidents. I know some parents who would instantly get their daughter a princess water bottle to prevent the taunting and consider the problem solved. It may resolve the immediate issue but it wouldn’t help her be resilient if another taunting scenario cropped up. The slightly disappointing parts that the book had were a chapter on minor coping techniques and a bit of celebrity name-dropping. The minor coping techniques being taught reminded me of being in school and saying, “I’m rubber and you’re glue!” I suppose it’s helpful for young kids when teasing gets out of hand but not really a solution to prevent bullying and wouldn’t work if the bully was especially aggressive. Regarding the name-dropping, the celebrities that wrote in supporting Carrie’s daughter were very kind to make themselves available. Sometimes it’s nice to know that even after being bullied you can grow up to be a successful, famous and generous individual, but there were a few times in the book when it was mentioned that a certain actor from a certain TV program mentioned something equally as insightful as a non-celebrity. I don’t believe the additional endorsement was required. I think Bullied: What Every Parent, Teacher and Kid Needs to Know about Ending the Cycle of Fear is an excellent entry-level book on bullying and would recommend it to everyone.